Waddington Alley is a small pocket of history within Victoria. It's been well covered by other serious and amateur historians because of its status as a peculiar portal to the interesting past of the city. You'd be forgiven for walking past the alleyway without a second thought. The nondescript passage that links Yates and Johnson Street is unremarkable at first glance. A closer inspection reveals the alley's most interesting feature below your feet. 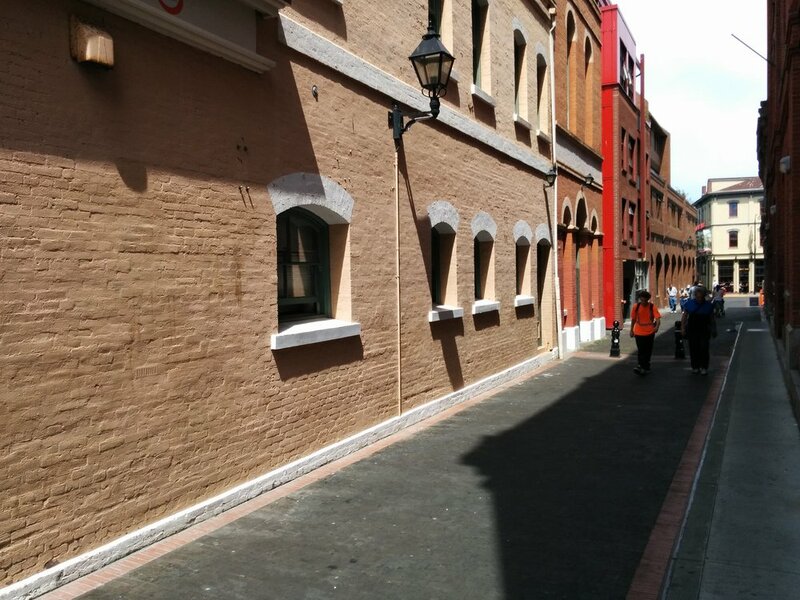 Instead of the usual asphalt, the alley is actually made up of small wooden bricks set into the road. You can read a great detailed account of the history of the alleyway on this website. The origin of the alleyway is attributed to a local gold rush entrepreneur and businessman, Alfred Waddington, in 1858. Waddington's objective was to connect three private lots he owned for ease of access. It was the general state of disrepair sometime after Waddington's death in 1872 that prompted the resurfacing of the alleyway in 1908. The creosoted wooden blocks made from Douglas Fir trees that you can see today were restored to their original state in 1992. Waddington Alley is a historical gem for the reason it's the last example of the way that roads were paved back at the turn of the century. Prior to 1942, there were many more examples of the surface around downtown Victoria. However, with the invention of the much more versatile asphalt all of the old wooden block pavements and roads were either ripped or covered up leaving Waddington Alley with its unique status.